My husband and I took our first trip to the Biltmore Estate in Asheville, North Carolina back in 2005. We had been dating for a year, and wanted to celebrate by going somewhere that we hadn’t been before. It’s beautiful up there, no doubt about that, but one of the weird little memories that I have of that trip was going shopping for food at 10pm on a Friday night. We were just driving down the road, looking for a grocery store that was open, before we finally came across one. As we’re hunting through the store, picking up snacks, alcohol, and breakfast for the weekend, we stopped by the fresh baked goods section. 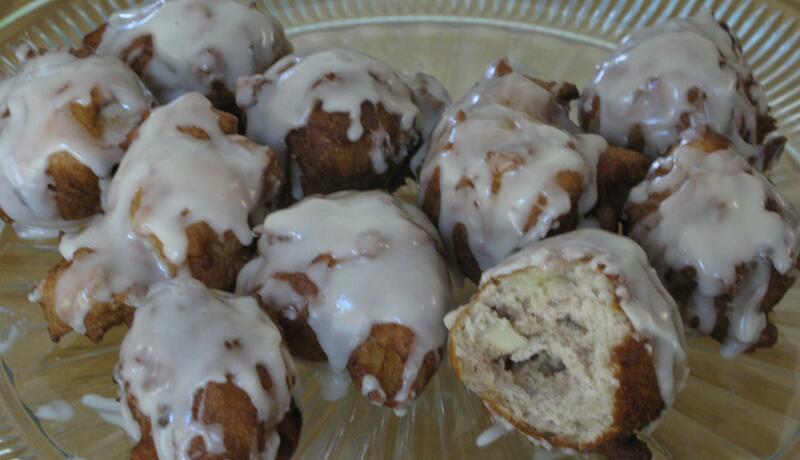 He saw some apple fritters, and gasped…and grabbed the package. That was the day that a mental note was made in my head that the hubster (or boyfriend at the time) loved apple fritters. Noted, and his excitement when I told him that I was making these was even freakin’ cuter. There are several blogs that I follow, and this recipe was on sinfullytempting.com. One of the things I love about Jeannette is that the fact that all of her recipes are about the taste. Flavor, richness, and insane yumminess are associated with the recipes that she posts. I was just drooling last night over the Zucchini Boats that she recently posted, and told my mom this morning that I was going to make those…soon. 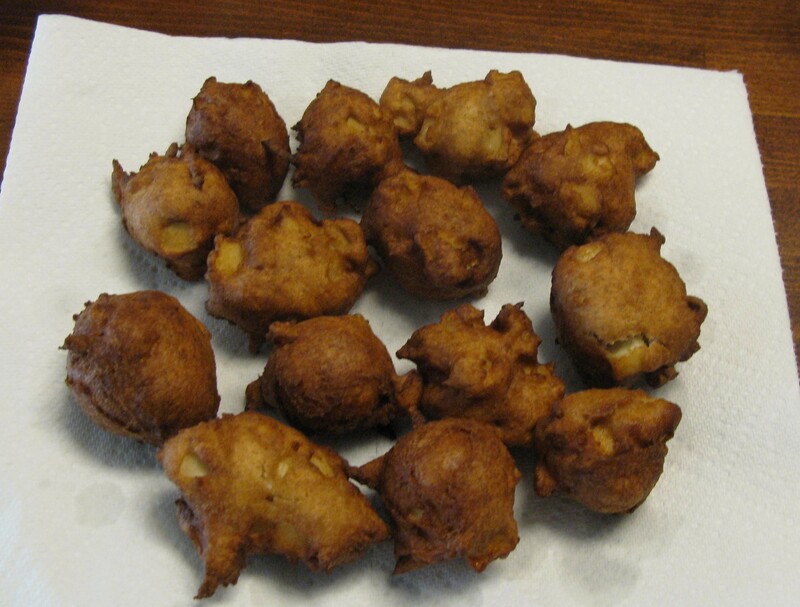 Well, I got this recipe for the apple fritters from her website. My mother-in-law spent the night with us over the weekend to get some grandma time with our little pumpkin, so I decided to make these for us. She and my hubby absolutely LOVED them, and they disappeared very quickly. First, stir the dry ingredients together. Stir in the wet ingredients first, then apples. Drop by a heaping teaspoon into the hot oil, frying on each side for a couple of minutes until they’re crispy and golden brown. Lay on paper towels to cool slightly and for the oil to drip off. Drizzle glaze on top of fritters. Eat the heck out of these babies. Heat 1 1/2-2 inches of vegetable oil on medium heat. Combine the first five dry ingredients in a medium size mixing bowl, whisk together to combine. Stir in milk and egg until batter is completely moist. Gently stir in apples. 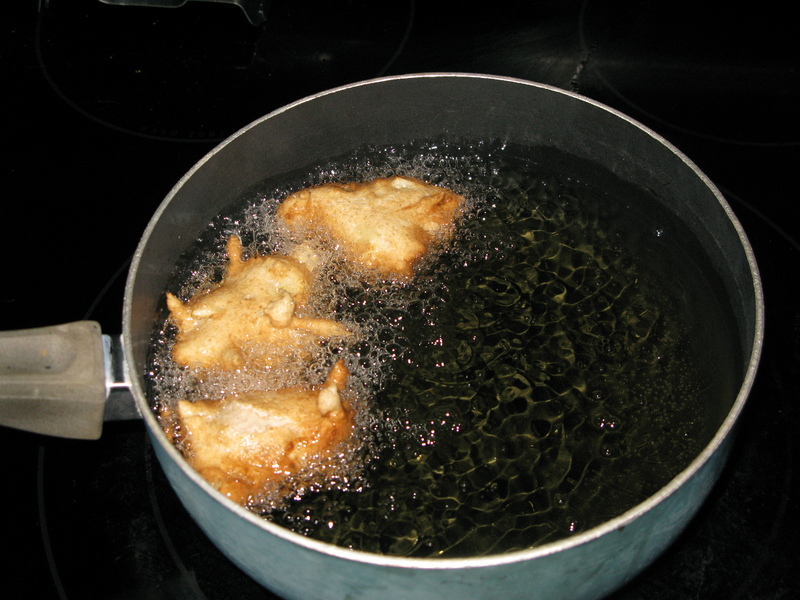 Drop by heaping teaspoons into oil, and fry for about 2 minutes on each side, until brown and crispy. Remove from oil, set on paper towels. Drizzle with glaze, serve warm. Combine ingredients in small mixing bowl, drizzle over fritters. I am invited for tea, right?! YUMNESS!! You’re very welcome, I look forward to trying more of your recipes!